This vintage genuine leather purse is a Saddle by Sabina Handbags. It has a thick black lining with a large interior zippered pocket with a caramel color leather tag with elevated letters. 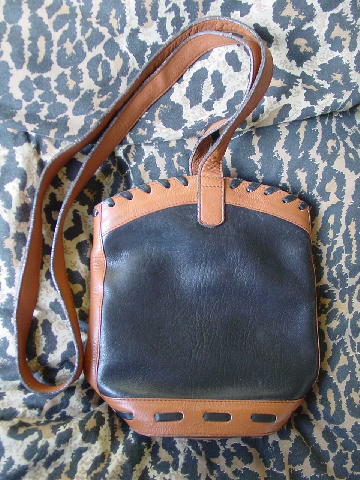 The front is soft black leather edged with a caramel color leather at the bottom, top, and sides. The front top and bottom have a decorative black leather stitching. It has a 48" long by 7/8" wide shoulder strap. 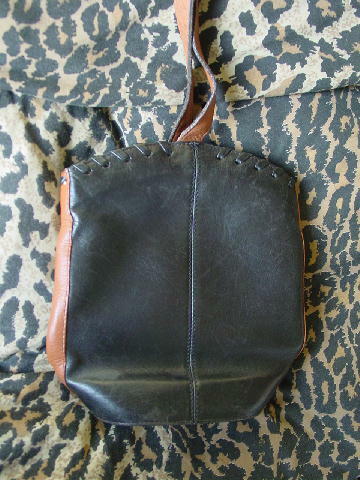 The back is black leather with a decorative black stitching at the top. The purse has some scuff marks. There is a top zippered closure.